U.S. stocks gained Thursday, bouncing back from a two-day rout, after the price of U.S. crude reversed higher, easing concerns for investors looking for oil prices to steady, and Federal Reserve Chair Janet Yellen's reported comments offset rate worries. "Stabilization in the energy commodity, that's going to help everybody psychologically," Art Hogan, chief market strategist at Wunderlich Securities. Published reports of Yellen's comments to lawmakers on Capitol Hill Thursday cushioned what some interpreted as a hawkish tone to a Fed release Wednesday afternoon, said Mark Luschini, chief investment strategist at Janney Montgomery. The market was "trendless early on until those remarks were fed through the marketplace," Luschini said. Investors also mulled earnings from corporations including Ford Motor (NYSE:F) and data that had a less-than-expected number of Americans filing for unemployment benefits. "The macro environment is still constructive," said Terry Sandven, chief equity strategist for U.S. Bank Wealth Management, citing varying degrees of improvement in employment, housing, consumer confidence and manufacturing. "Forty-eight percent of S&P 500 companies offer dividend yields above the 10-year Treasury yield of 1.8 percent," said Sandven, adding that the risk-reward equation remains 'favorable for adding on dips." Alibaba Group Holding (BABA) fell after the Chinese e-commerce company reported quarterly revenue short of expectations; McDonald's (MCD) gained after the fast-food chain said its chief executive officer would be replaced by its chief brand officer March 1; Qualcomm (QCOM) dropped after the chip manufacturer cut its fiscal 2015 outlook and Ford Motor climbed after the car manufacturer's quarterly earnings surpassed estimates. Stock futures added to gains after the Labor Department reported jobless claims dropped by 43,000 to 265,000 last week, fewer than forecast and the lowest number in nearly 15 years. However, the week included the Martin Luther King holiday, increasing the volatility of the numbers. "Jobless claims were exceptional, and reinforces what we saw in the Fed's message yesterday, that the U.S. economy remains pretty firm," said Luschini.Stocks offered muted reaction to another report that had pending-home sales dropping 3.7 percent in December. After falling as much as 55 points, the Dow Jones Industrial Average (Dow Jones Global Indexes: .DJI) closed up 225.48 points, or 1.3 percent, at 17,416.85, with Boeing (BA) and McDonald's leading blue-chip gains.Reversing after a drop under 2,000, the S&P 500 (^GSPC) added 19.09 points, or 1 percent, to 2,021.25, with materials leading gains and all 10 major sectors advancing.The CBOE Volatility Index (^VIX), a measure of investor uncertainty, dropped 8.2 percent to 18.76. The Nasdaq (^IXIC) advanced 45.41 points, or 1 percent, to 4,683.41.For every share falling, two gained on the New York Stock Exchange, where 863 million shares traded. Composite volume cleared 4.1 billion. Crude futures (: @CL15G) turned higher, up 8 cents to $44.53 a barrel and gold futures (CEC:Commodities Exchange Centre: @GC15G) dropped $31.30, or 2.4 percent, to $1,254.60 an ounce on the New York Mercantile Exchange. The U.S. dollar (Exchange:.DXY) turned higher against the currencies of major U.S. trading partners; the yield on the 10-year Treasury note (U.S.:US10Y) used in figuring mortgage rates and other consumer loans rose 3 basis points to 1.7522 percent. 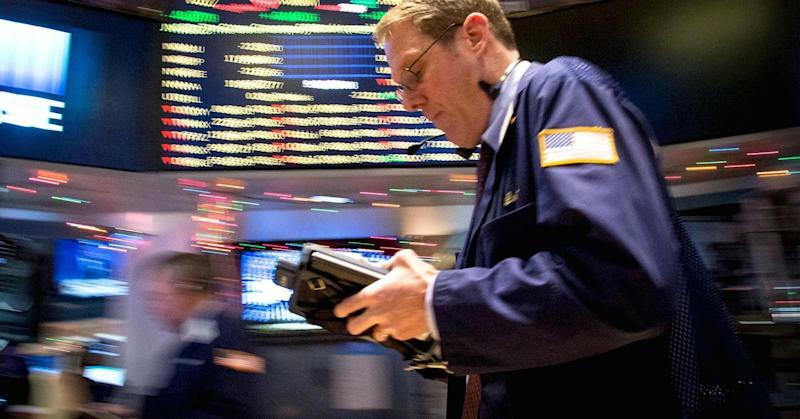 On Wednesday, U.S. stocks declined, a day after the S&P 500 took its biggest hit in more than three weeks, as the energy sector expanded losses after U.S. crude settled at its lowest since March 2009.